PHILADELPHIA (WPVI) -- Philadelphia Eagles fans can dress for success while helping a good cause, all courtesy of Lane Johnson. 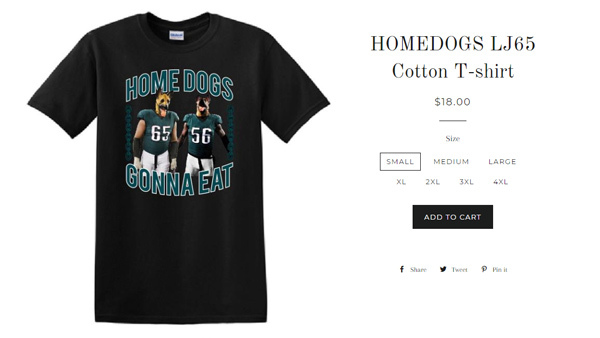 The Eagles right tackle unveiled his "Home Dogs Gonna Eat" t-shirt on Monday night. The shirt is available through Johnson's LJ65 online shop and at Chickie's and Pete's restaurant on Thursday from 7 p.m. to 10 p.m. It costs $18. Johnson says all proceeds from the shirts are donated to the Fund for the School District of Philadelphia. "The goal of LJ65 is to help The Fund for the Philadelphia School District while providing trendy athletic gear," the website reads. The shirt shows Johnson and defensive end Chris Long wearing their German Shepherd masks. The duo sported the dog masks after the team defeated the Atlanta Falcons on Saturday night. The Eagles were the underdogs going into the game. Since then, the dog masks have grown in popularity, with Amazon even selling out. The Eagles say fans will be allowed to wear their dog masks at Sunday's NFC Championship Game, just not while going through security. The question of who let the dogs out still might not be answered. But where will the dogs be? That answer is looking like Lincoln Financial Field in South Philadelphia this Sunday night.